We are out of salsa, but there are no tomatoes in our garden even close to being ripe. I'm not sure what to do. We could (*gasp*) buy some salsa. We actually did that last week for our family vacation--I needed some for a recipe. We didn't like it all that much. I mean, it was OK, but not like homemade. Or we could (*gasp*) buy tomatoes. That's what I do when we have the misfortune to run out of salsa during the winter. The trouble is, no one else around here has ripe tomatoes in their gardens, either, so the tomatoes I would be able to buy are likely to be somewhat...tasteless. Or we could (*not-sure-what-to-put-here-but-somehow-*gasp*-doesn't-seem-quite-right*) wait until we have fresh, ripe garden tomatoes with which to make salsa. I'm leaning toward that third option, actually. Any homemade salsa is yummy, but the sweetness that tomatoes ripened on the vine in the sun bring to the mix? It's magic. Want to know who is not leaning toward the third option? AKD. I have no idea when this child of mine started liking salsa. He's really not a fan of spicy food. But one day, all of a sudden, he was eating gobs of the stuff. It was two or three batches ago. He dubbed that batch diabolo salsa, because it started out sweet, and then the hot hit ya. Also, he called it that because I wouldn't let him call it devil salsa. He just kept eating it, scoopful after scoopful. His face was red; he was sweating and gulping down glass after glass of cool water. I asked him why he didn't just stop eating. He said because it was so good, but it was also so bad, but it was also so good. He was conflicted, in other words. Loving and hating and loving that salsa all at once. And he cannot imagine having to wait 3 or 4 weeks to eat homemade salsa again. He even offered to help. But I'm still not sure what to do. The struggle is real. No menu plan post today, but I do have this lovely recipe to share. I got this recipe from my mother in law, Beaver-ly. I tasted these the first time I ever met her. And just look what happened--I married her son. Not just because of the bars, of course. With gooey caramel sandwiched between layers of chocolate, these bar cookies are delicious, easy to make, and come together quickly. Mix together dry cake mix, 3/4 c. melted butter, and 1/3 c. evaporated milk. Press about half of this mixture into the bottom of a greased 9x13 pan. It will look like it's not enough to cover, but don't panic. It will work. Bake in a preheated 350°F oven for 6 minutes. Melt together caramels and remaining 1/3 c. evaporated milk--you can do this on the stovetop, in a double boiler, or in the microwave. Immediately upon taking the partially baked cake layer out of the oven, pour caramel mixture evenly on top of cake mixture. Sprinkle with chocolate chips, then drop the remaining cake mixture by teaspoons-full on top. Return to oven and bake at 350°F for an additional 16-18 minutes. When finished, the bars will still be jiggly, but the spoonfuls of cake on top will look dry. Allow to cool completely before cutting. 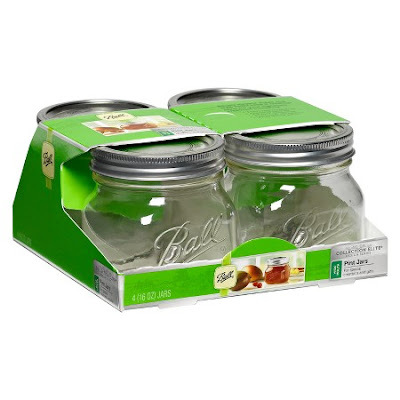 The Bullseye store has an amazing deal on canning jars this week. This is noteworthy because canning jars rarely go on sale. 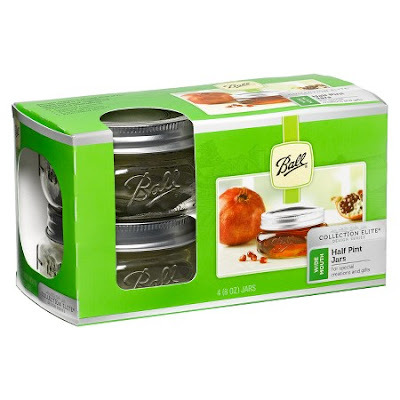 The deal is, buy three canning jar sets, get a $5 gift card. 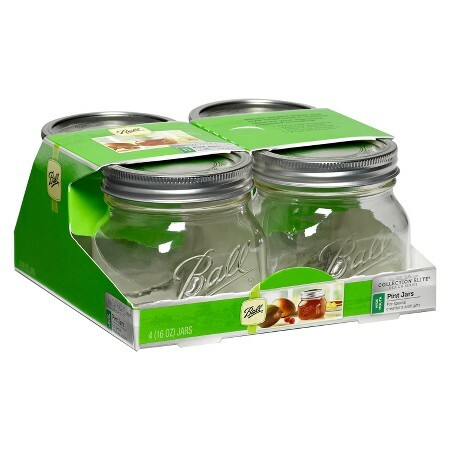 And since prices start at $4.39 for a four-pack of wide-mouth half-pints, I could get a dozen for $8.17--only $0.68 each (my favorite thrift store prices canning jars at $0.99 each)! And these things are adorable. I am such a sucker for canning jars anyway, but when they are as cute and sweet as these? I'm having a hard time restraining myself. And why, you might ask, should I restrain myself? I mean, why not buy the adorable canning jars, if they would make me happy, especially at such a great price? First of all, they would not make me happy. Oh, they would make me happy for a short time, and I suspect I would experience a little jolt of happiness each time I saw one (I do when I see my cute little 4 ounce jar), but things don't have that power. They really don't. Things don't make people happy, regardless of how diligently we try. Second, I don't need any more canning jars. I have dozens of them already. Dozens of dozens, actually. Sure, most of mine aren't cute, but really, how many canning jars does one need? I'm willing to bet that I know people who don't have any canning jars. Not one. And they seem to be doing just fine, despite their lack. I tried to justify a purchase by telling myself these would make special and cute gift jars, but when it comes right down to it, I don't think I would be able to bring myself to part with any of them, so that excuse doesn't wash. I've come to the conclusion that my only recourse is to stay out of the Bullseye store until the sale is over. Almost always a prudent course of action to stay out of the Bullseye store. But of course, they're also available (with the gift card for buying three) online. Stand strong, Scarlet! One more day. You can do this. (If you read my blog via email, you'll probably have to visit my blog to view the video--click here to do that). The first time I met the Bluefields, I was struck by two things. One: they are always on the go. Two: they eat often. It became kind of a joke between us--do an activity, then eat, do another activity, eat again. Our recent trip to Yellowstone and Grand Tetons National Parks was just like that. This made my family, and in particular AKD, very happy. And, in true Bluefield fashion, I feel like I need a vacation to recover from our vacation. Somewhere in Wyoming. The boys couldn't resist the opportunity to have a snowball fight in June. I hightailed it out of there as soon as one flew close. We biked about 16 miles at the base of the Tetons, from Jenny Lake to Moose, WY, and back. We have a new family memory now... remember the time... when we went on a family bike ride... in the rain... and it hailed...? It sounds bad, but it was actually kind of fun. We biked in wedge formation, and Bubby was a rock star biker. This is the moose at the visitor center... in Moose. ...another beautiful waterfall. This was the day we traveled from Grand Tetons back to Yellowstone. This was a timed selfie ("us"-ie). Set the photo timer on your phone for selfies. The timer counts down on the screen, so everyone knows when the photo will be taken. The screen is facing you, so everyone knows what the picture will look like, and can plan and adjust accordingly. And, most importantly, you won't jostle the camera by pushing the button to take the picture. Brilliant. Most people think of Old Faithful when they think of Yellowstone, but there are hundreds of geysers, mud pots, hot springs, and steam vents in the park. We saw many of them. They were stinky. And warm. The boys relaxing in our campsite. Yes, AKD's hammock is set up over the fire pit. We rented an RV for the trip--this was my favorite campsite. Sometimes we do things just to make the mama happy--like getting our picture taken. Or in this case, we do things to make the daddy happy. Some, or maybe all, of the children were pictured-out by this point in the journey. Some of them are better at hiding it than others. We saw bison, moose, elk, and a family of grizzly bears on our trip. This was the most up close and personal we got, though, in Custer State Park (SD). On the way up the Cathedral Spires trail in Custer State Park. No menu today. Because it's summer. Finally. Hooray for summer (sort of. Remember, I'm free to complain about summer as much as I want). But I did want to share something with y'all today. It's a mountain of laundry. Aren't you glad I shared? After spending a week in the mountains of Yellowstone and Grand Tetons National Parks, this is a pile of about 4/7 of the laundry. And actually, it's also gone. Well, sort of. With four baskets of clean laundry to sort, fold, and put away (and more on the way), I was feeling a little overwhelmed. So I just dumped it out on our freshly vacuumed living room floor, set up five laundry baskets in a semicircle around the mountain, and set the kids to work sorting. They just picked up an item, decided whom it belonged to (no easy feat considering that three of these men are similar in size, but I'm pretty sure most of the items were correctly categorized), and threw it toward that person's basket. Most of the things even made it in to a basket. It was so much fun that my kiddos kept at it until the pile was gone. No worries. As I said, there's more on the way. Today, and all summer long. Hey y'all. I know what you're thinking. You're thinking, Scarlet, I thought you said your menu plan posts would be sporadic over the summer. I thought last week's menu plan was so mentally taxing you didn't think you'd be able to do it again anytime soon. Well, surprise! My amazing husband helped me put this one together, so you get another. Just don't get used to it, ok? So, how's your summer going so far? I mean, late-spring-but-school's-out-and-it's-after-Memorial-Day-so-we're-calling-it-summer. How's that going for you? Ours is proceeding in true Bluefield fashion, which is to say that I suspect I will need a vacation to recover from this vacation. Here's what's on the menu this week. Well, the good news is, it's summer "break" and I'm giving you a menu plan. Are you surprised? It's just because I love you. The bad news is, it was so mentally taxing to put together this menu that I'm not sure I'll be able to do it again anytime soon. The other bad news is the pool is...um...shall we say...a little...cold. The other other good news is I pressure canned ten quarts of pinto beans and six pints of black beans last week. And every single jar sealed. Double whoohoo! And the other other other good news is there's no other other bad news! Triple whoohoo! I've been reading a new devotional on my iPad: Pressing Pause: 100 Quiet Moments for Moms to Meet with Jesus by Karen Ehman & Ruth Schwenk. As the title suggests, this book contains 100 short chapters, each with a Bible verse or two, a meditation, a short prayer and a couple of questions to think about. After the questions there's space to journal a response (for the electronic version, readers are encouraged to use a note-taking app to journal their response). Each of the devotions deals with a topic that moms can relate to, like "Playing Favorites," "Teaching Your Children Courage," "Becoming Less," and "Picking Up Dirty Socks (Again!)." Each chapter is short, requiring about 5 minutes to read, along with however long the reader wishes to think about the questions. The authors use personal narrative to inspire other moms to take time to meet with Jesus each day. From "The Joneses Are Overrated"
Yes, the Joneses invade our homes and our thoughts several times a day through social media and the Internet, robbing us of contentment. In a letter to the believers in Philippi, the apostle Paul penned Philippians 4:11-13, which says, "For I have learned to be content in whatever circumstances I am" (HCSB). The Greek word rendered "content" in this verse denotes more than just a throwing up of arms in reluctant acceptance. At its hub, it means "to be satisfied to the point where I am no longer disturbed or disquieted." From "We Have to or We Get to?" How about we hit the restart button when it comes to our tasks? Let's stop pouting. Rather, let's reframe our attitudes Colossians 3:23-style. I don't have to clean my house. I get to clean my house--because I have a place to call my own, while many are homeless or displaced. And I'm serving the Lord Jesus as I clean. I don't have to fill out this team permission slip. I get to fill it out--because my child is healthy enough for physical activity. And I'm serving the Lord Jesus as I write. I don't have to drive to get groceries. I get to do this errand--because we have enough money to purchase provisions and we own a car, so I don't have to walk. And I'm serving the Lord Jesus as I shop. We don't have to. We get to. And thanks be to God That We do. I am enjoying this devotional. Reading these devotions is a great way to start my day with Jesus. I received this book for free from the publisher through BookLook Bloggers in exchange for my honest review. On Memorial Day weekend in 2008 Joshua Becker was on a mission--a mission to clean out his garage. He planned to take everything out, clean the garage, and put everything back. Throughout the day, his 5 year old son kept asking him to play, and Mr. Becker kept telling him that as soon as the garage was done, he could play. Each time, he'd say, "almost done." On that day, gazing at his driveway full of dirty, dusty possessions, Mr. Becker realized that his stuff was the source of his discontent. He noted, "I already knew that possessions don't equal happiness. Doesn't everybody? At least we all profess to know that our things won't bring true satisfaction. But in that moment, as I surveyed the pile of stuff in my driveway, another realization came to me: Not only are my possessions not bringing happiness into my life; even worse, they are actually distracting me from the things that do!" Thus began Joshua Becker's journey toward minimalism. In the years since that day, Mr. Becker has learned a lot about minimalism, and he shares the best of his knowledge in his book, The More of Less: Finding the Life You Want Under Everything You Own. Minimalism is about, quite simply, owning less so that one may have more time and energy, more money, more generosity, more freedom, less stress, less distraction, less environmental impact, higher quality belongings, less comparison, and more contentment. This is a good book. Mr. Becker has some great advice about why and how to go about minimizing. It's well written and engaging, with a good mixture of anecdotes, statistics, and techniques. There is nothing special about this book, however. I imagine there are any number of books about minimalism that contain roughly the same information. I, personally, have been feeling drawn toward less lately, so I enjoyed the book and found it inspiring. If you'd like to get a feel for Mr. Becker's style before committing to buying the book, check out his blog, Becoming Minimalist. I received this book for free from the publisher through Blogging for Books in exchange for my honest review.